When I first joined the New York Pipe Club, I really wasn’t sure what to expect. 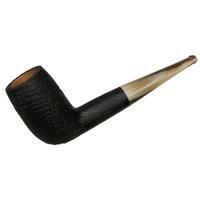 I considered pipe smoking to be a rather solitary and sedentary pursuit, and envisioned a group of laggards like myself—gruff, quiet introverts—sitting placidly as grazing cattle. I was pleasantly surprised by how engaging it was to learn from my peers, be exposed to new tobaccos and pipes as well as new perspectives, and to simply enjoy the company of like-minded fanatics; finally, here were people who could really understand my PAD and TAD. My involvement with the club has increased my passion for the hobby a hundredfold, not to mention my education in it, and even encouraged me to partake in the wider community by contributing to PipesMagazine.com. As I became more involved in the pipe world, I realized our club’s membership included veritable luminaries in the hobby like Vernon Vig (recently inducted into the Confrerie de Maitres Pipiers in Saint Claude, France) and Peter and Jon Guss (architects of the Balkan Sobranie and John Cotton Throwdowns [along with their brother Matt Guss of the Seattle Pipe club]). The idea to create club blends had been discussed for several years, eventually culminating in Lou reaching out to Russ to begin serious deliberations at the 2010 Chicago show. A first batch of samples was prepared that August, and the taste testing began. Anyone who smokes a pipe knows that we tend to be a most finicky and opinionated group of individuals; thus it was that over the course of the next two years a barrage of taste testings, opinion polls, blending suggestions, mountains of emails, and numerous reformulations finally culminated in what we consider to be four sublime representations of Tobaccos We Like. We cannot thank Russ enough for his patience and perseverance over the course of this project, and we don’t think anyone else could have done the job the way he did. The blends were created through a synergy of Russ’s estimable experience in translating the ideas for the flavor profiles that we presented, and every member of the club participating in fine-tuning the samples to our collective tastes. That is not to say that everyone unanimously likes every blend, and I actually want to go out of my way to illustrate that point—there is no blend that will satisfy every smoker, and therein lies the beauty of individual taste. However, the blends as presented have hit a remarkable consensus of approval, and in this writer’s humble opinion, are some of the finest examples of their genres. Having been in the tasting game for a while now, I am still impressed by how many people picked up on the same exact notes. The superb tin artwork was also a collaborative effort of the club’s members, with our own Dan Silverstone volunteering his talents in the role of creative director. Dan is a long-time member of the club and an avid smoker & collector whom many of you may have met at the pipe shows, as well as being an accomplished drummer, art director / graphic designer, and even a part-time tobacconist. Like the tobaccos themselves, the artwork and presentation of them likewise went through many drafts that were reviewed by the club members, tweaked and re-tweaked, named and renamed, and finally presented to you here in their final incarnations. While he was at it, Dan even reinvented our club logo, infusing it with a classic Art Deco feel (and a pipe!) that truly says "New York". Yours truly was indulged with contributing the descriptive text, and as you can see these are being offered initially in full 2 ounce (57g) metal tins, date stamped on the bottom for your cellaring pleasure. Needless to say, there is no way that I could be entirely unbiased in my assessment of the club’s blends. They’re all magnificent, frankly, and I’ll brook no argument on that. In order to avoid any cries of foul play, however, I decided to enlist the help of some friends from the PipesMagazine.com forum instead of doing a standard review of the tobaccos for this article. Adam J. Smith, aka schmitzbitz, has done numerous reviews for the magazine and has a great handle on detailing flavor profiles of any genre thrown his way. CortezAttic is another long-time and prolific member of the community with a great palate for Virginias whom I knew I could count on for a sharp assessment. BaronSamedi was an obvious choice as a go-to guy for Latakia blends; unfortunately, he fell ill during the exercise and was only able to contribute some aroma notes. I approached them with the idea for the article, simply asking if they’d like to do a blind taste-test of some tobaccos I had. They were not informed of the contents (other than the genre; e.g. "Virginia Blend"), the blender, or that they were for the NY Pipe Club, until after I’d received their feedback. Editor-in Chief and Big Kahuna Kevin Godbee also contributed to the panel; although because the man is somehow privy to every little thing happening in the tobacco world, I was unable to keep him in the dark about the blends’ contents. Rest assured, however, that he was not paid in any way for his evaluation of the tobaccos. I think that they all did a superb job picking out the flavors of the blends, even on those that didn’t necessarily appeal to them, and would hope that the reader will appreciate the unbiased input and honest opinions of the reviewers. And so, without further ado, I present to you the New York Pipe Club’s New York State of Mind Collection. "Born in 1938 as Laurence B. Koback, we fondly came to know him as Sailorman Jack. He had a vast knowledge and love of pipes and tobaccos and never tired of talking about them, as well as sharing many stories from his own life experiences. He got his nautical persona from his love for sea shanties, salty songs of the sailing men of old which they sang to alleviate the boredom of their daily work aboard ship, and which he sang with revelry in the many taverns and night clubs of Manhattan. 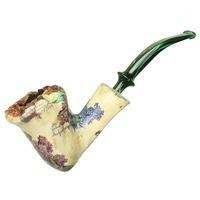 Jack loved very strong tobaccos and smoked Latakia-laden blends almost exclusively. His fondness for cigars inspired him to begin to add varying amounts of fine cigar leaf to his Latakia concoctions. Along with various Virginias, Perique, and of course Latakia, he blended a version that he found to be perfect. He called it simply his Cigar Leaf Blend, and was always eager and generous in his willingness to share it with his brothers of the briar. He eventually shared his recipe with me, which we have now used in creating a blend in honor of our founding member and first president. Jack became a regular poster on the Internet newsgroup alt.smokers.pipes, and gained a large following worldwide with his ‘Morning Watch’ and ‘Three Bells’, or whatever bell he happened to wake at, posts. His vast knowledge of pipes and tobaccos, and his willingness to share it, gained him much fame on that particular Internet bulletin board. His usual signoff became as famous as he; ‘Fair Winds and Following Seas’ he would write, and we all waited for the next day’s watch to hear from Jack once again. Jack was also a fixture at all of the New York Pipe Shows, and his familiar and booming voice called, ‘ATTENTION, ATTENTION!’ whenever there was a drawing for a door prize. 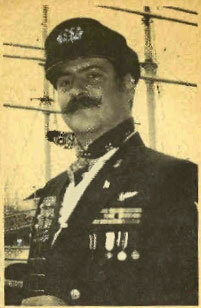 Sadly, in April of 2006, after a battle with cancer, we lost our beloved Sailorman Jack. He was a larger-than-life character from our hobby, a true patriot of the briar, and was loved by all. He is sorely missed." Kevin: Wow, Virginias, Latakia, Perique and Cigar Leaf all in one blend! I decided to eat a hearty dinner before sampling this one. The tin aroma is surprisingly sweet. It smells like an English / Balkan-style blend. I can’t detect the cigar leaf in the aroma, but I can see it in the tin. 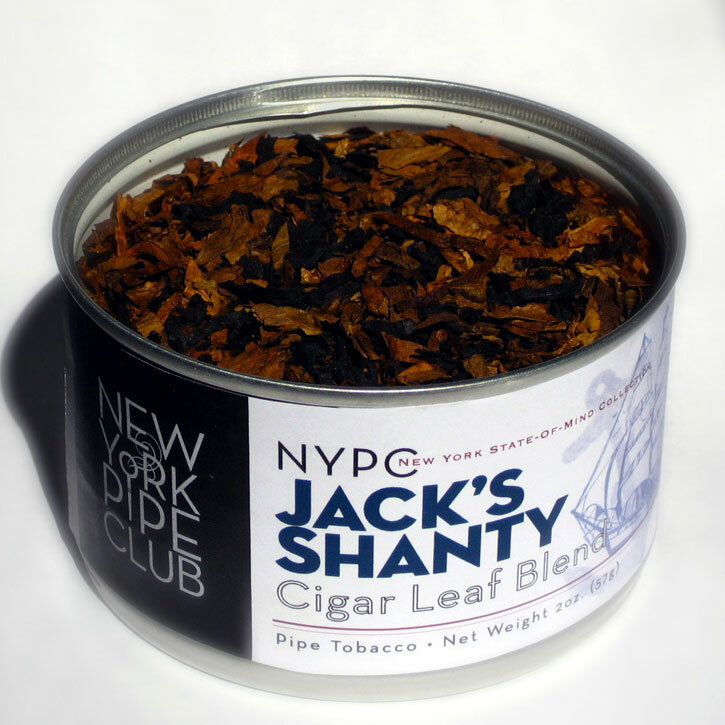 Jack’s Shanty provides rich, thick smoke and a full flavor. Interestingly, none of the individual tobaccos dominate. They are all married together to create a wonderfully flavorful synergy. There is a deep rich flavor that makes Kentucky Straight Bourbon Whiskey a great accompaniment—I suggest 1792 Ridgemont Reserve. This is a great after-dinner smoke. Adam: I could smell this blend—or, more correctly, the Latakia in this blend—while it was still sealed in a ziplock bag and a pair of envelopes…and several feet away. My interest piqued, I’ll admit that I was all atwitter with excitement when I loaded this up for the first time. BaronSamedi: The English was dominated by the Lat, but I’m guessing there is some VA in there and maybe some Burley? It had the roasty smell and a lighter note than the Balkan. Both had enough Lat for my wife to go "Woah!" before I even opened the envelope! Next in the lineup is another Latakia blend, our Hell’s Kitchen Balkan Deluxe. One of the main points that the club focused on for this series was that they should all be "classic" tobaccos, free of gimmicks or flavors other than tobacco. We obviously have a large contingent of Latakia lovers, and so offer this decidedly beguiling blend. From the tin: Our Balkan blend is dominated by complex and exotic oriental leaf, fragrant and lightly sweet. Cyprian Latakia and Dark Fired Kentucky components are in just the right measure to define, but not overwhelm, the ambiance of the smoke. A classic rich Balkan blend that is as storied as the neighborhood that bears its name. Kevin: The tin description is highly intriguing. Orientals, Latakia and Dark-Fired Kentucky. I’m anticipating a rich, medium-to-full bodied smoke and can’t wait to taste the combination of Latakia smokiness mixed with Dark-Fired Kentucky smokiness. The tobaccos in the tin have every color in the tobacco spectrum from light to dark and everything in between. The tin aroma is dominated by the smoky Latakia, which is typical in a blend with this tobacco, whether it dominates the flavor or not. And it does not…the tin notes say that the Orientals dominate, and they definitely do. The bowl starts out a little bit sour, which is definitely the Orientals claiming the lead role. The sourness subsides, and becomes more tart. 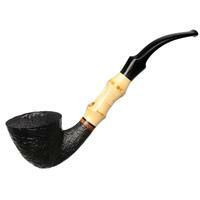 With the listing of Dark-Fired Kentucky, I was expecting a fatter smoke, but this is as described—a Balkan blend. If you’re a nicotine lightweight, then don’t worry about the DFK here. It is extremely subtle. I wouldn’t have known it was there if it wasn’t listed. 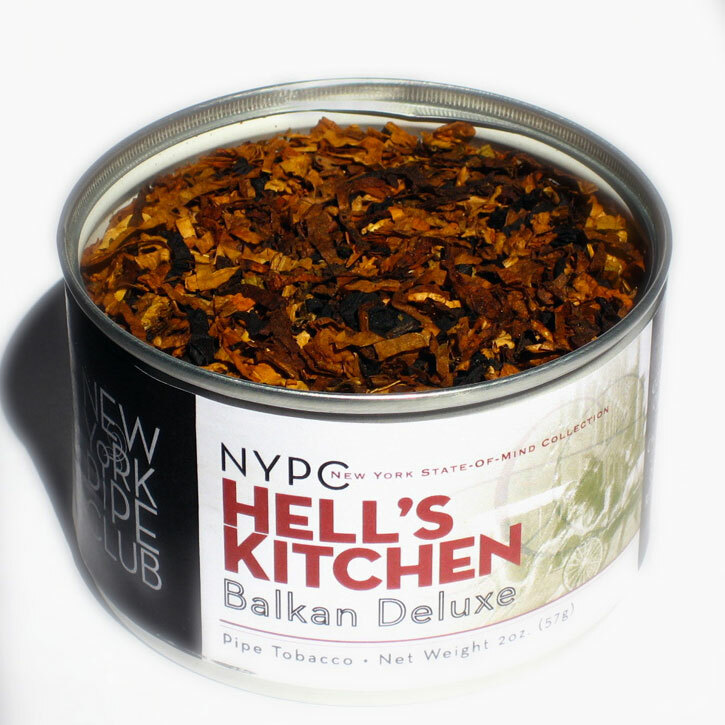 Hell’s Kitchen is a mildly smoky, slightly tart, complex recipe that is an excellent example of the Balkan Blend style. This is not a Latakia-bomb, nor a strong Kentucky. Even though they are both present, they have supporting roles to the exotic Orientals. I like it a lot, and will smoke it often. Adam: This blend impressed me the most out of the four blends I was presented with—in fact, it impressed me more than most blends I’ve had the pleasure of sampling, and has found a place right smack at the top of my rotation. 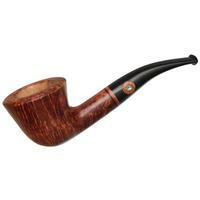 Visually astounding, this coarse-cut blend provides a rich, creamy smoke abundant with honeyed and fruity sweetness, underpinned with an almost musty, earthy note. The Latakia plays a secondary role, providing balance between the high- and low- end notes, while a complex balance of Orientals bring a fleeting, almost sour to bitter nuance deep in the background. As the bowl progresses towards the mid-way point, the bright honey sweet notes begin to mellow, allowing the earthiness to come through, while still providing a deeper, caramelized sugar and brown-butter sweetness. The Oriental components provide a tart "punch", while remaining deep in the background of the flavour profile. Through the last third of the bowl, the sweeter notes dissipate even further, allowing the earthy and savory nuances to fully form into a musty flavour, not unlike wet-soil and leaf-litter; underpinned by a slightly leathery note. The Orientals grow somewhat more assertive, losing the tangy mélange of flavour while developing more marked notes of cumin and thyme, while a sweet peppery note begins to grow in the background. Through it all, the Latakia remains stable, providing a wonderfully camphor-esque note that seems to bring everything together. In fact, as I look over all my notes on this blend, I see but one detractor in common—namely that I don’t already have several pounds squirreled away for my smoking pleasure! BaronSamedi: The Balkan had the leathery Latakia note and also a nice barbecue spice, so I’m guessing maybe some Perique in there. Not to be outdone by the devilish mélange of Hell’s Kitchen, our exercise in pure Virginia is a study in how to make a single varietal really stand out. Russ really outdid himself with Bowling Green; with so many all-Virginia blends out there, this was perhaps the hardest category in which to really come up with something unique. That he did, with the finishing touch being the pressed cake presentation which marries the flavors marvelously. From the tin: A malty richness, piquant zest and fully-developed body hallmark this unique pressed cake. The remarkable balance of three hearty reds with both yellow and stoved black Virginias is of an appropriately historic character, perfect for cellaring. Kevin: I love Virginia tobaccos, so I had high hopes for this one with three different types, and five different leafs of Virginia, plus the pressing yields some of my favorite flavors. Bowling Green delivered on its promise. The tin aroma is of prunes, apricot and canned peaches. The flavor is a nice combination of sweet and tangy, reminiscent of dried apricots. It was a great Springtime smoke on my balcony in the afternoon sun. This surprisingly aromatic blend is a true Virginia-lovers delight. Sweet, grassy brights mingle with fruity Reds to form the base of the flavour profile, while the blend is kept from growing saccharine by a healthy portion of dark-fired leaf. A touch of character is added through a slight peppery (think chili) spiciness which builds as the bowl progresses, however never grows overwhelming or overpowering. CortezAttic: Well, I’ve been smoking the Straight Virginia for most of the last few days, and I’ve gotta say it is a really really good blend. Did you create it? If so, nice job! This is something I’d have no qualms about buying and recommending to others. There are lots of nice tastes going on here—delicious, dark fruit sweetness; but as for my powers of discernment, well, let’s see how I do. This is a very satisfying smoke from a nicotine and sweetness perspective, and it is very inviting. It creates a great volume of luscious dry smoke with each puff, it burns wonderfully slow, and doesn’t even come close to being bitey when pushed. I got best results with a smaller bowl because in the bigger bowls its woodsy framework was fatiguing. All my samplings were dried out a tad with a hot air blower before smoking. I only have two bowlfuls left—which I’m saving to re-sample in the light of the tin description you provide. 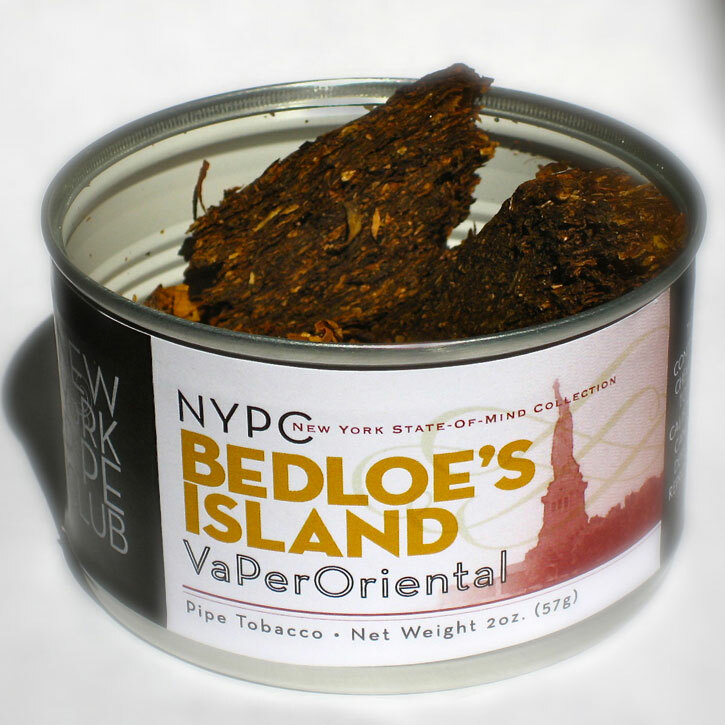 Rounding out the collection is my personal favorite, Bedloe’s Island, a Virginia / Perique / Oriental blend par excellence. This blend benefited the most from the pressing treatment; the difference between our beta samples of the pressed and unpressed are astounding—unpressed, it was a very good blend that had a lot of flavor points, but somehow just fell short of being cohesive; there were a lot of disorganized notes, and some too-tart edges. After pressing, it really became a perfectly orchestrated symphony. In the words of Dan Silverstone, "If the Virginia is a telescope, this is a kaleidoscope!" Of particular note is a hint of allspice—not the desiccated and dull allspice you buy from the grocery store, but allspice trees freshly in bloom; it’s a divine memory of the tropics for me. From the tin: A dramatic merging of bright Virginia with a generous portion of Acadian Perique is invigorated with a measure of Macedonian oriental leaf and presented in a pressed cake. Sweet on the top, it develops into a lush, complex smoke with a savory body and layers of flavor from the oriental component. Kevin: Loved it. It reminds me of baked goods, both bread, banana bread, and carrot cake. The light brown / dirty blonde crumble cake looks deliciously edible in the tin. The tin aroma is similar to the flavor, being that of semi-sweet baked goods or muffins. This is an extremely tasty and well-balanced Virginia / Perique / Oriental blend. Adam: I knew from the first moment I opened the baggie containing my sample of this blend that I was going to like it. Exuding a delicate, almost liquor-like aroma of raisins and baking bread, this surprisingly bright, loosely pressed crumble-cake does require some drying time prior to smoking. The wonderfully composed flavour profile features the fruity sweetness of Red Virginias, mellowed by the almost fig-like note of Perique. Depth and complexity are abundant, provided through the skilled use of earthy and tart Oriental leaf (particularly Izmir? ); adding an almost herbal note, particularly bold when exhaled through the nostrils. As the bowl progresses, the Perique slowly grows more assertive, with the peppery kick becoming noticeable towards the bottom third, while the Virginias develop a "bassy" bottom-end sweetness not unlike caramelized molasses and brown-butter. I’ve often said (rather quietly) that every VaPer should feature Oriental components, and this blend has cemented my thinking. Excellent now, it should prove to be exceptional with some age. If you enjoy blends of the ilk of McClelland PCCA Tudor Castle, do yourself a favour and check this out - you will not be disappointed! I just spent the last 50 minutes "in the zone" with the blend labeled VaPerO. It was a great experience, and I really like this blend. My guess on the components is that is has red Va, Burley (something like C&D uses a lot), Perique and Izmir. Throughout the smoke it is Izmir forward with its musty-yet-sweet aroma, taste and finish; and the Perique probably contributes to the mustiness, but its presence is mostly detectable by a ubiquitous peppery tingle. In fact I’m inclined to call this an Oriental blend, not a VaPer. The Va has a restrained sweetness with woody undertones that I think is produced by a Burley, but this side of the flavor matrix is very well integrated and I don’t seem capable of parsing it out. Overall great balance in flavor, body and strength. meriting high marks in the smoothness department. I love the nice volume of chewy smoke, and the burn is fantastic—2 or 3 matches max. Even when pushed this blend doesn’t bite. Whatever technique you used to produce the cake, I can’t detect anything other than a mild sweetness—and I don’t pick up any flavoring. There you have it folks, the unexpurgated reviews of the forthcoming New York Pipe Club blends in all their glory. The only editing that was done was for minor spelling errors and fixing the em dashes and quotation marks (I’ll admit to a bit of OCD when it comes to that). For legal purposes, I suppose I should add the disclaimer that the "Editor’s notes" were mine, not Kevin’s, and intended for humor only—no reviewers were actually harmed during the writing of this article. Be sure to stop by the Habana Premium / Pipes & Cigars table at the Chicago show and sample them for yourselves; if you like them be sure to tell Russ, and if you don’t, well, just keep it to yourself. 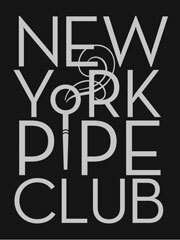 And if you’re ever in New York City on the second Tuesday of the month, please feel welcome to join us at a meeting of the New York Pipe Club. Great job, Bill! Thank you Kevin for the web “space” and for announcing our blends to the hobby, I appreciate that so much! Many thanks, and my personal heartfelt thanks go out to Russ, whose patience I have tried over and over and like the true gentleman and friend that he is, always demonstrated great forbearance throughout the long journey that we embarked on in 2010. He was always willing to perform the numerous tweaks we asked for over the sampling process and then shipping the samples to us to try. I am so happy with the way the blends turned out. I feel as though they offer the hobby, not simply four additional blends but four that offer an alternative to each of the genres that they belong to. Many thanks to my club brothers Dan Silverstone who designed the label artwork, new club logo and tin verbiage and Bill who polished up the tin verbiage as it appears on the tins. I also would like to offer my personal thanks to all of the member brothers of the NY Pipe Club who offered their suggestions and opinions of the blends as we progressed through the journey. My only hope is that the good brethren of the entire hobby enjoy the blends as much as I do. Kudos to the New York Pipe Club and Russ for creating four excellent blends - your hard work was well worth it gentlemen! I suspect there will be something of an ordering frenzy when these are available to the general public, and deservedly so. Also, kudos and thank-you to Romeowood for an exceptional article, and for giving me (amongst others) the chance to participate in the blind panel reviews. It is always interesting to see how ones notes compare to their peers, and refreshing to see that we are all on the same track. This wonderfully well written and beautifully illustrated article does great justice to the quality of the tobaccos I was privileged to sample in the blind taste test. It was a real hoot participating, and I hope the NYPC benefits richly from the project. Congrats to the NYPC! These look like great blends, and I love the tin art. It is a pretty crowded marketplace out there, so I hope they find some success. Great reviews here. I will have to try these hometown blends out! I had to include this as well, please pardon my enthusiasm! Please allow me to thank you for your willingness to be the herald of our club’s proud achievement; our NYPC tinned blends, to the world of our beloved hobby! Your passion and devotion to the hobby is unparalleled and along with your website, just what we need to further our love for briar and leaf for generations to come. I cannot express enough thanks and appreciation I have that you agreed to run the exclusive. It could not have been orchestrated any better! The article was expertly written; great job, as usual, Bill! The reviews could not have been more favorable, and yes, the inclusion of the varied opinions pro and con was, genius. It gives the entire article and review process a stamp of authenticity, because, let’s face it, after all, taste is purely subjective however, when a blend is good, it’s good and there is complete agreement over it. I am so glad that the reviewers enjoyed them and I think the article will cause to generate much interest and anticipation for their Chicago debut. I cannot wait! Thanks to Russ for his patience and forbearance with me throughout the entire process. You have demonstrated saintly qualities, my friend! 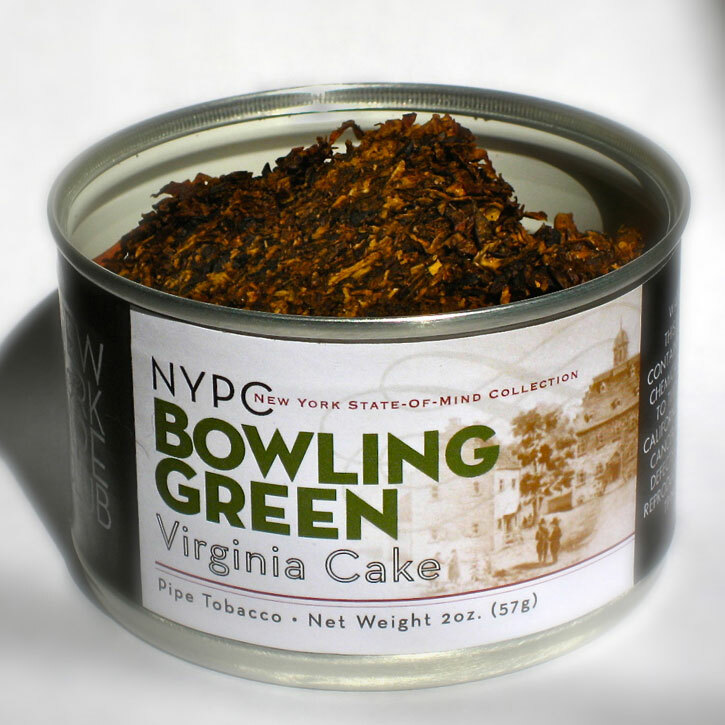 I also thank my brothers from the NYPC: Dan, whose expert and professional graphics design gave the tin labels a NY City flair all their own. To Bill and Dan for creating and perfecting the tin verbiage. To Michael Bernhaut and all his suggestions, advice and counsel, especially his suggestion for the concept of the “NY State of Mind” name we gave the “collection” as well his eagle eye proof reading of the final versions of the labels. To my tobacco tasting focus group who offered their sage advice and opinions to make these blends what they are today. And finally, thanks to all of my brother members of the NY Pipe Club and I leave out not a single one, who offered suggestions on everything from names to tin verbiage, sampled and commented and not the least of which, put up with me and my desire for tobacco perfection which I think, we have firmly grasped with these blends. This, almost two year process, could not have been accomplished if any of the components were missing. My heartfelt thanks go out to all. My hope is that the entire collective brethren of the hobby enjoy them as much as I do. Thank you again and I look forward to their debut in Chicago! I apologize for the speech-like appearance of this post! Huzzah! This was the most fun I’ve had writing and organizing an article, and I hope folks get at least a chuckle out of it, if not a new favorite blend. Thanks again to Adam, Kevin, Cortez’Attic, and BaronSamedi for being test subjects and not pulling any punches. I do not usually get excited about any new blends, as I have too many old and favored ones to savor already. BUT, you guys have totally blown me away with this endeavor. The blendings sound addictive and delicious from your reviews; the artwork and verbiage is the most attractive and descriptive as I’ve ever seen or read about in ANY new release. I’m not that interested in throw downs, blow downs or hoedowns, so this has to be the highlight of tobacco news for me. Thanks to each and every one of you talented guys from The Big Apple for the great effort, I am eagerly anticipating trying these truly new blends. Great to see these NYPC blends! I can’t wait to get my hands (and pipe) on them. How soon after Chicago will they become available? How did my little project blend go over with the NYPC? I know one fella (Avi, I believe it was) said he enjoyed it. Did anyone else give it a try? Once again, Congratulations to you and the NYPC!!! When and how can we buy these? I would love to add them to my collection. Thank you Kevin. I look forward to giving them a try. You just can’t go wrong with Russ O. doing your blending. I am going to order a tin of each ASAP. The only thing better than a blend created by Russ and the NY Pipe Club is FOUR BLENDS created by this creative gang. 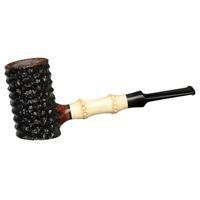 Great review and can’t wait to get them out here to the Seattle Pipe Club pipemen & pipewomen! I know this is going to be big. Elephants also have a 2 year gestation and look how huge they are! Congrats to the NYPC!